I do like tinned fish. I've written a few blogs in the past about them. I sometimes have them in salads, often on sandwiches, but more than likely just have them in the tin on the side of a meal for a bit of surf and turf. 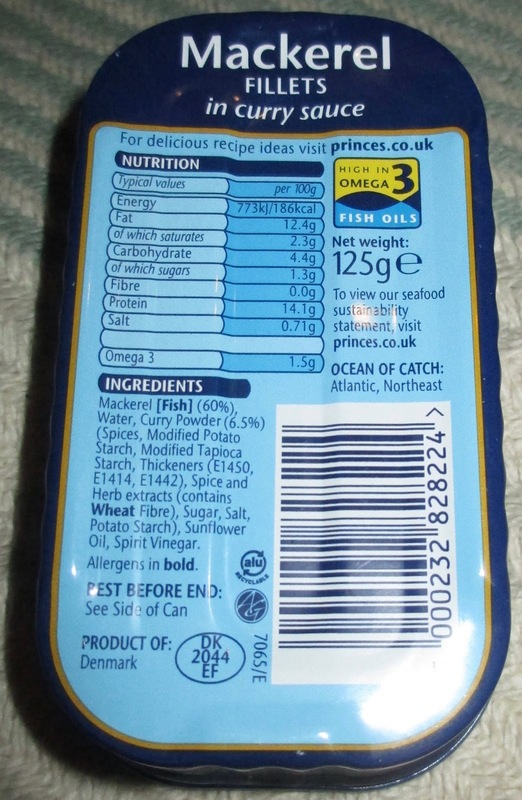 Produced by Princes this tin of Mackerel Fillets in chip shop style curry sauce struck me as a little different. I haven't had chip shop style sauce for ages, instead opting for chicken tikka kebab meat, battered sausage and large chips whenever we visit the local chippy. Chips and curry sauce was a staple favourite of mine on the way back from the pub on Friday and Saturday nights when I was a lad. I don't know what it is about chips dipped in chip shop curry sauce, but it goes particularly well after a few pints and especially with a chip butty on the side. 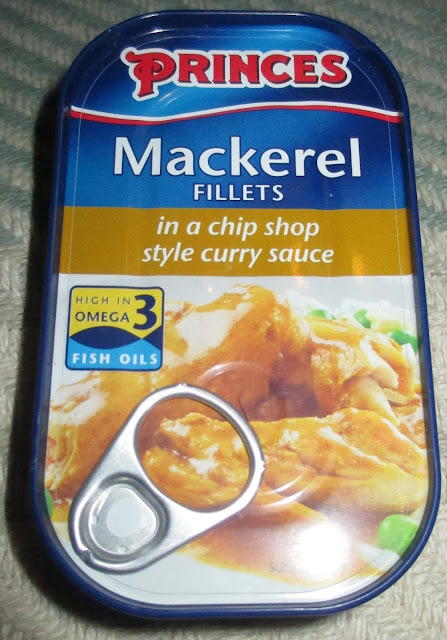 On peeling back the tin lid there was a familiar creamy yellow tint to the sauce covering the mackerel fillets. There was a smell of curry sauce mixed in with the mackerel aroma. I had some chips on the side with bacon and fried eggs. I dipped a chip in the sauce and was rewarded with that good old chip shop curry sauce flavour, albeit a little fishy. Eating the mackerel out of the tin with the rest of my meal was indeed a treat. The chip shop style curry sauce went surprisingly well with the mackerel. In fact I'd go as far as to say that this is one of my favourite flavoured sauce tinned fish and will definitely be hunting out some more Mackerel Fillets in chip shop style curry sauce. The 125g tin contained 186 calories per 100g, also having 12.4g of fat, 1.3g of sugar, and 0.71g of salt. Rich in Omega 3 fish oils, please see photograph for the ingredients.